Life has been a whirlwind of traveling lately! I have just returned from a 16 day trip to Costa Rica with G Adventures and I am still pinching myself over this experience! Last autumn, I had a phone interview with G Adventures (note: Considering a G Adventures trip? Consider using the affiliate links in this article, as they help support this site at no extra cost to you) about my previous travel experiences and how I turn the stories, excursions, and uncomfortable-ness into words as the Intercultural Immersion Editor at WE. In the interview with G Adventures, I traced my story from my small village in Haiti to high school in Boston, gondola rides in Venice, Tufts genocide education programs in Rwanda, and studying abroad in Chile! I was so intrigued and excited to share my story with someone - to express the thrill, exhaustion, and personal (inevitable) growth that comes with trekking the world. 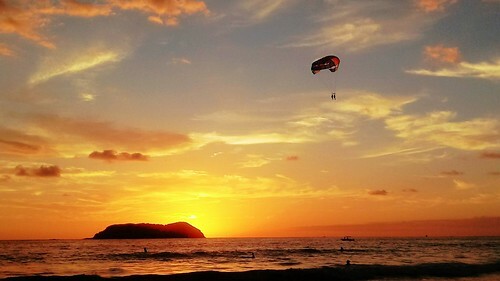 We’ll take the excursions of Costa Rica step by step from what to bring, what to eat, and making the best of the bursting culture hidden in the rural lands of this great country. 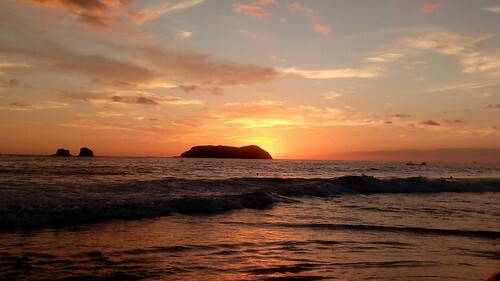 First up -- Quepos, home of Manuel Antonio National Park and Beach where all things monkeys, snakes, and sunsets dwell. Our first stop after landing in San Jose was Quepos! Quepos is a small town located in the Puntarenas province in the central Pacific coast. We rode about three hours on a public bus as I gazed agape at the unfolding green landscape. I was still thawing from the 20 degree weather from Boston. 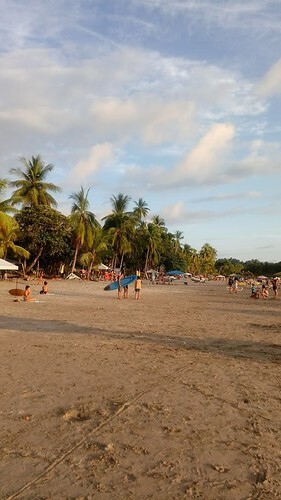 The main attraction in Quepos is the Manuel Antonio National Park. We dropped our bags at the hotel and headed to lunch near the beach! 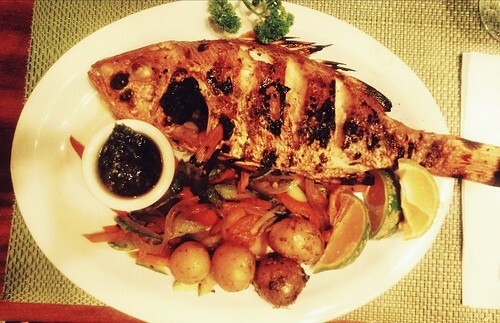 We had a delicious lunch during which I took on the semi-impossible feat of devouring a whole red snapper. With the full support of my roommate, I came closer than I thought I would. Alas, I live to fight (eat) another day. Then we hiked the incredible 30 second walk to the beach! Our first afternoon was spent drinking coconut juice while overlooking the perfect sunset in 70 degree weather. The salty ocean breeze was hitting our faces as we did cartwheels on the beach! It was all worth it, including the 5AM Christmas morning flight to get there. New-cartwheel expert, enveloped in sunscreen, and refreshed with coconut juice, I woke up the next day ready to see monkeys! It was time for Manuel Antonio National Park. An oldie but a goodie! The animals are more active in the cooler air (mornings and evenings), and mornings at the park are less crowded. I highly recommend getting one with a group of friends. Costa Rica is a rich country - rich in culture, wildlife, and people...and the guides know detailed history about the species (even the smallest, hidden ones). They also inform you of wildlife conservation efforts in the park, as well as insights on where the animals tend to live. We spotted lots of little critters as well as huge sloths that live in trees. There is so much to see in the two hours - we walked agape, staring up searching for animals, but sometimes the small little critters were crawling on us and we did not even notice. The guided tour takes almost two hours to complete, so it is best to keep ample time between activities and not run to a boat tour ride, like I did. 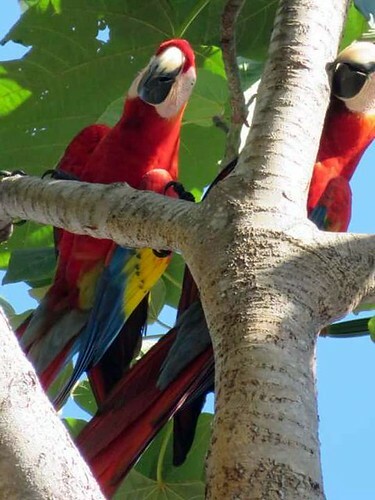 Getting a guide is not only a great way to learn more about the wildlife, but it is an excellent way of supporting the local economy of Quepos. I cannot stress this enough: do not underestimate the monkeys. 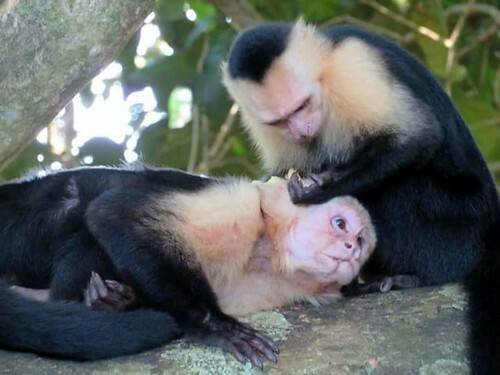 The monkeys have no stage fright, shame, or guilt - armed with home court advantage, they will make a monkey out of you. We were briefed about their friendliness and hunger by our Costa Rican guide, who said, “You have to be careful since the monkeys can distract you and grab your lunch.” The monkeys are a friendly species coming near by balancing on branches, screeching at strangers, and flying between tree limbs that lurk above our heads on the trail. Ahh, monkeys, the courageous acrobats of the animal kingdom. I salute you, brethren. A snake fell on a woman on the beach that same day. Plop -- just landed on her and slithered away. The poor woman squeaked in disbelief as strangers repelled from her. I leaped in fear (and laughter, tripping in the sand). I was elated that I was not the victim, and gathered what remained of my mango snack with one goal in mind: get away from this beach. Thankfully, the park ranger strolled over (chuckling at us) and lent his arm as a branch. 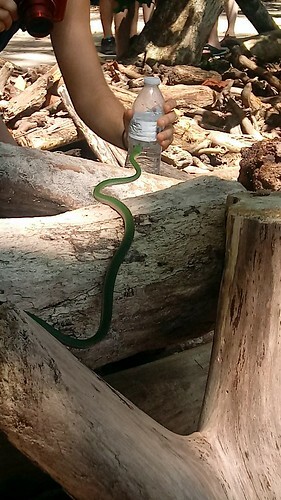 The snake quickly got the hint and crawled onto his arm and he carried the ophidian to the woods. The ranger then returned to eating his sandwich calmly. This was not his first rodeo. I know your time in Quepos will leave you with cherishable memories. 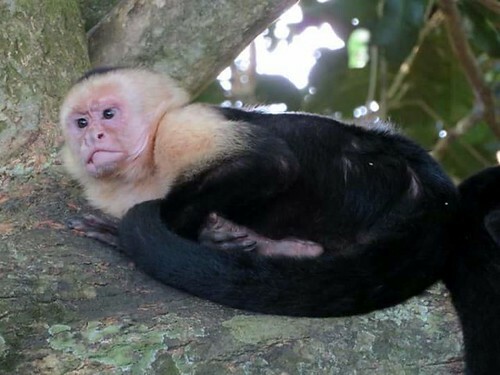 You will laugh at the monkeys, sunbathe under the Costa Rican sun, and beg to come back again. 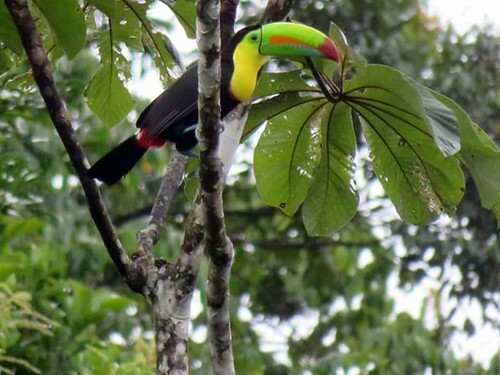 Costa Rica is for animal lovers, and the government enforces many strict conservation efforts. 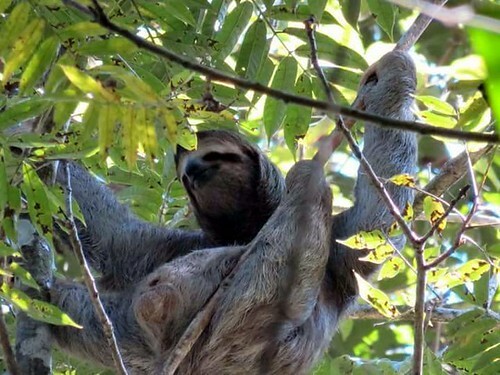 Costa Rica is home to the animals - this is where they thrive, live, and survive. It is imperative for you to be a good guest when these animals allow you into their homes -- respect their schedules and ways of life. Take memories, leave footprints. *G Adventures sponsored the travels of our Intercultural Immersion Editor to Costa Rica. 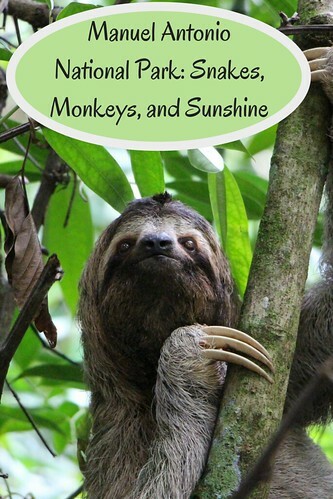 She spent 16 days there on the Costa Rica Adventure Tour (click here to learn more). However, all tripping over feet, cringe-worthy puns, and mango snacks are her own. Stephane Alexandre is the Intercultural Immersion Editor for Wandering Educators. She studied abroad in Chile and graduated from Tufts University this past May. She is very passionate about creating opportunities for young people to travel and explore the world around them. She has traveled to ten countries engaging in new cultures ranging from studying abroad in Chile and leading a genocide education program in Rwanda. She sincerely believes that young people achieve greater goals when they create global connections that enable them to be active citizens in all corners of the world. Word photo creative commons, adapted by Wandering Educators. Animal photos courtesy and copyright fellow G Adventurer Noelle. First bird photo, snake photo, and all other photos courtesy and copyright Stephane Alexandre.